“NOBODY could have done what I’ve done for Puerto Rico with so little appreciation,” President Donald Trump announced on October 8th. Boricuas, as denizens of the island are known, have yet to display the gratitude their president seeks. The islanders have been particularly galled by the contrast between his perceived slights to Puerto Rico and his all-hands-on-deck rhetoric during Hurricanes Harvey and Irma, which pummelled Texas and Florida. Explaining the difference, Rick Wilson, a Republican consultant critical of the president, has suggested Mr Trump thinks of Puerto Ricans not as American citizens, but rather as “sea Mexicans”. Even in an era when polls show record levels of partisan division, a few things, such as disaster relief for those lacking food and water, ought to transcend political calculation. In fact, electoral considerations appear to have been a big factor in how the government allocates aid ever since Congress expanded the president’s discretion over disaster declarations in 1988. A government motivated solely by the desire to help victims would decide when and where to declare a disaster—a step that turns on federal funding for services like debris removal—purely on the basis of need. If that were the case, areas hit by bigger catastrophes would be more likely to be officially classified as disasters than places which absorbed only glancing blows. Two regions that suffered similar misfortunes should have equal chances of receiving such a designation, regardless of their political leanings. According to a study conducted in 2011 by Andrew Reeves of Washington University, given two natural disasters that inflict the same amount of damage, presidents have been twice as likely to declare a disaster when one occurs in a swing state like Ohio or Florida, with a roughly equal number of Republican and Democratic voters, as when one happens in a politically uncompetitive place. Presidents of both parties have been equally guilty of this, and it has continued during the six years since Mr Reeves’s work was published. A similar pattern can be found in spending figures. 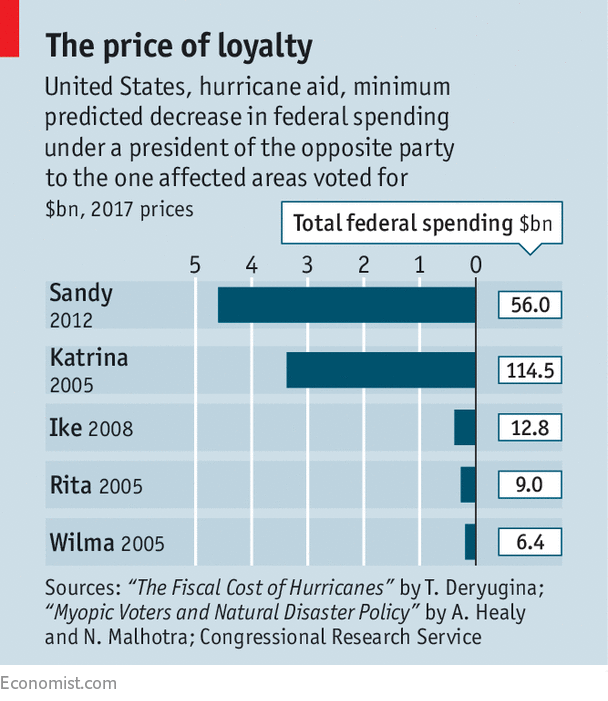 In 2009, researchers at Loyola Marymount and Stanford found that for any given level of damage from a disaster, a one point increase in the vote share for the president’s party in the most recent election was associated with a 1.8% increase in federal aid. For hurricanes in particular, the data suggest that this effect may be even stronger, and is apparent even for areas separated by a few miles. Using that study plus data from the University of Illinois, we built a model to predict hurricane relief funding received by every county in America from 1985 to 2004, based on each jurisdiction’s typical exposure to disasters and the wind speed of each storm. For every one point increase in the incumbent president’s vote share, federal aid per resident rose by about 2.5% during the next four years. The evidence also shows that voters reward officials for showering their regions with federal largesse, though their support does not come cheap. According to research by Neil Malhotra of Stanford Business School, it takes about $27,000 of relief spending to “buy” just one extra vote for an incumbent party. It would be far more efficient to invest that money in disaster preparation, since each dollar governments spend on preventing harm from nature’s wrath is thought to yield some $15 in savings on future relief costs. Unfortunately, the electorate seems to reward only politicians who open up the public purse after damage is done. Officials who reduce the losses caused by disasters in the first place receive no credit at the ballot box.